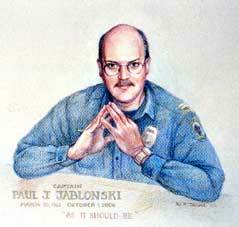 The Jablonski family honored Larry, John and I by asking us to talk about our dear friend Paul. I would like to honor Paul’s family for their care of Paul during the last three weeks of his life. They did a superb job of ushering Paul into the next life. He fought a hard fight during those three weeks and several family members invited him to let go of this life if the fight became too much which ultimately it did. If Paul’s family members were able to stand up here today the three things they would tell you about Paul are that he was a person who took care of others; he had a great sense of fun and that he was a man of great depth. As Paul’s brother-in-law Bob said so eloquently Paul was the youngest brother in the family and a big brother to all. 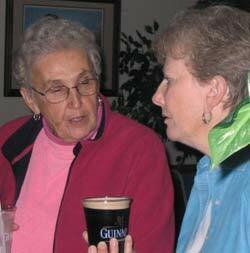 Paul’s sister, Jude, recalled something that happened at Irish Fest which nicely illustrates this. Paul found out a performer at his stage wanted tea. Not only did Paul locate tea for the performer he found a tea set to serve it in – on the Irish Fest grounds! Paul took great care in caring for others. As family friend, Gail said, Paul could fix anything and did. I know Paul performed many kindnesses we will never know about. 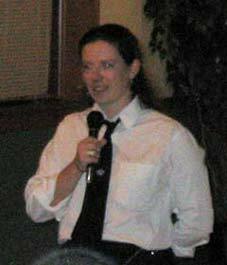 Paul’s sister, Mary, described Paul as a loving heart with a wry smile. Paul’s sense of fun was always lurking just around the corner and would jump out at unexpected times. A good example of this silliness was Paul’s expertise in something he dubbed “Arm’s Length Photography”. Paul’s arms were so long he was able to take pictures of himself with a group of people by holding the camera out in front of him. He became very good at it and amassed a large collection of Arm’s Length photos! The purpose of eulogy is to offer public testimony of an individual’s life and accomplishments emphasizing the positive. Therefore I will not deviate from that tradition by telling stories about some of Paul’s “less than positive” moments such as during the comprehensive exams for our Masters degrees when he, I and several others were scolded by the department secretary for making too much noise when cursing our professors for not asking the “right” questions or the many times when I was subjected to Paul’s infamous rides in his new cars when he insisted on taking me out onto the highway to demonstrate both the speed and maneuverability of his new car which usually violated every known traffic law and regulation. Instead I wish to offer, in keeping with the tradition of a public eulogy, testament to my friend as The Good Man. He was the Good Man in regards to his mother in his selfless duty and respect toward her as a person and her needs. He was the Good Man in regards to his brothers and sisters in his attempts to assist them in resolving their life’s issues demonstrated by his generosity of time and assistance while supporting them in their moments of joy and success. He was the Good Man in regards to his colleagues at Marquette in his display of fairness, professionalism and integrity. He was the Good Man in regards to his life as a Christian Catholic exhibited by his high, moral character and his willingness to serve his fellow man without expectation of rewards or notoriety. He was the Good Man in regards to his friends with whom he laughed, cried and trusted, demonstrated by his displays of humor and his sharing of both anxieties and dreams. He was quick with a story, to lend a hand, to listen with an open mind or to provide a strong shoulder upon which we could lean. We have lost that Good Man. We are made poorer by his absence. I shall grieve the loss of my friend Paul for the remainder of my days. My faith tells me, however, that Paul is now in a place absent of pain and suffering. I will, therefore, take comfort and strength in the eternal joy and happiness that Paul now experiences in the kingdom of God. I wish for all of you gathered here today, especially for his Mother and siblings, that you may be comforted and strengthened by the reality of Paul’s eternal peace. May God bless Paul; may God bless us all. Paul was blessed with a loving and well-knit community of friends and co-workers. 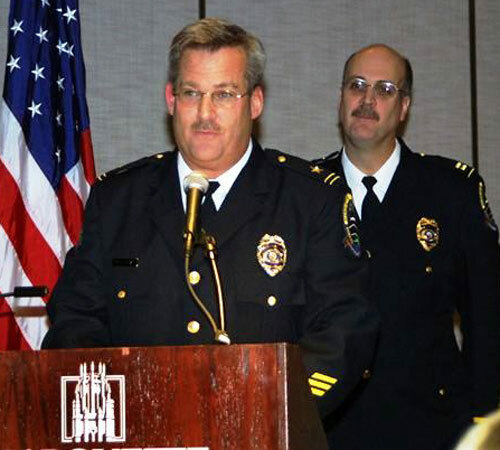 Larry Rickard (at right, and below) spoke movingly of Paul's 23 years of service with Marquette University's Public Safety Department. The Department dedicated its new station to Paul's memory. 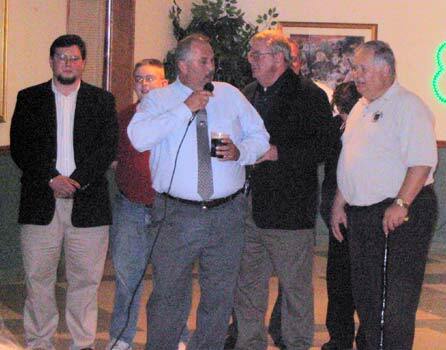 Eamonn O'Keeffe (at left) organized an "Irish Wake" at Paul's request. 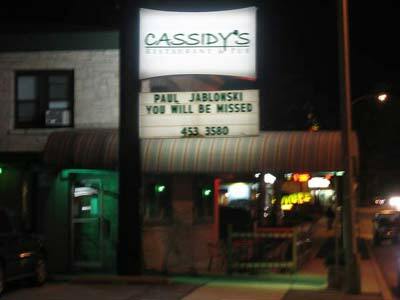 Musicians whom Paul had connected with during his long years with Irish Fest -- Frogwater, Gaelic Storm, Cherish the Ladies, the Makem & Spain Brothers and The Bridies -- called and sent kind notes of support. 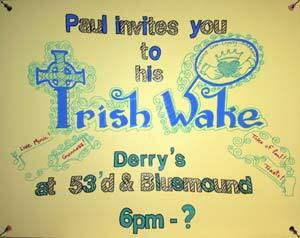 And at Paul's request, many made substatial donations to the Brendan Heart Fund. 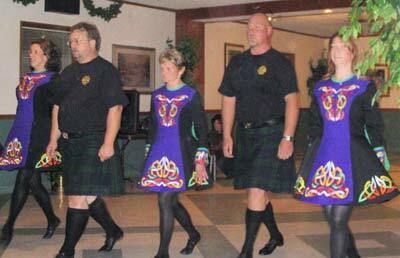 Katie Berigan (nee Higgins) (below, at right) a Lieutenant with Public Safety, and Pipe Major for the Milwaukee Fire and Police Pipe Band, coordinated the music at Gesu Church. 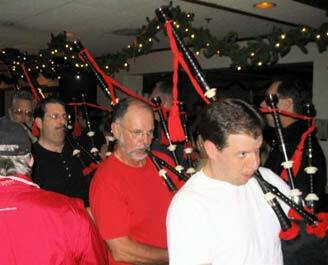 She even brought the band to perform at the wake, joined by the Glencastle Irish Dancers and the MIlwaukee-based Celtic/eclectic band Frogwater. I would like to take this opportunity to thank those of you who shared your heart-felt concern and prayers throughout the last month with my department and Paul’s family. We can’t thank you enough and are very grateful. The spirit and strength of the Jablonski Family is incredible. These beautiful, caring people. I am honored and humbled that Paul would want me to speak of him in front of each of you. 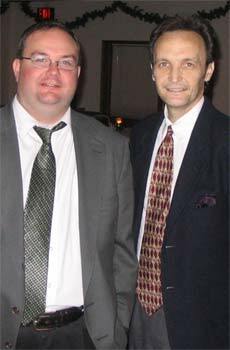 Paul was one of the most sensible, loyal, warm-hearted and caring people I have ever met. Paul never missed an opportunity to help someone in need, throw a smile someone’s way or simply sit down and talk to them about a problem. He wanted people to feel his kindness. Paul shared himself with so many people. He was an incredible human being, a wonderful man. For those of you who had the privilege of knowing him I’m sure you will remember; his hardy laugh, those large slow strides when he walked, his ability to go down a flight of stairs in only 2 large footsteps - sideways, his habit of kneeling down to talk to people at their desk, his quick wit, his infectious smile, his great appetite for cars, motorcycles, food, music, reading, good conversation and Irish bars. Let us also not forget the big bear hugs he gave to the ladies. When he would shake your hand he would wrapped his left hand over yours, all the while looking you in the eyes. That showed people he really cared about them. When you look at the Avenue West Police substation and the beautiful remodeling work that was done for the Milwaukee Police, Public Safety, Probation and Parole, and the entire Near West side community at the corner of 21st and Wells – think of Paul. 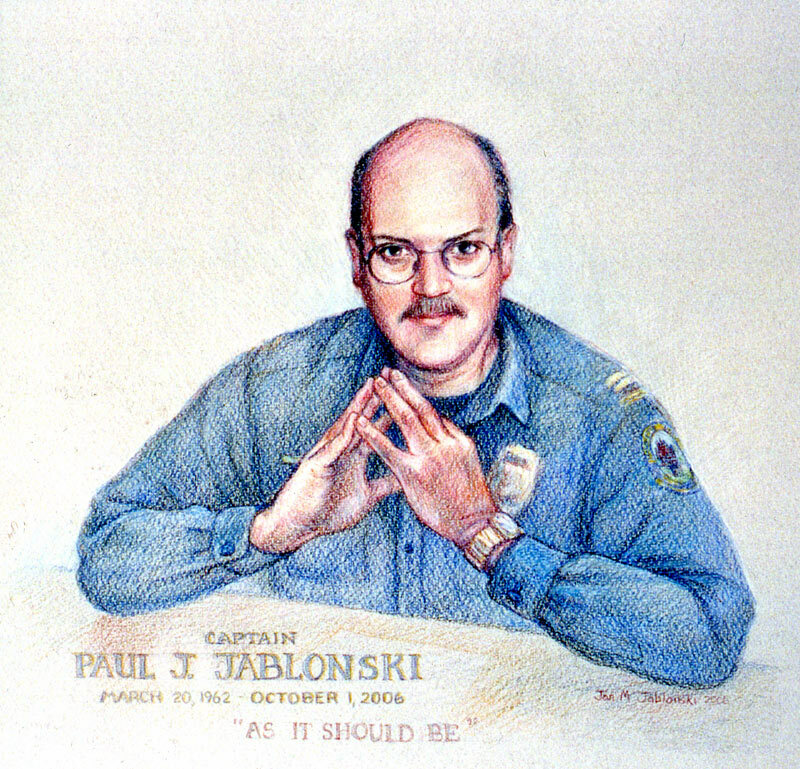 When you visit our department and see the professional appearance of our roll-call room, arms room storage facility, Command Information Center, the remodeled conference room, and many other projects he made happen, through his vision, for the officers, staff and students benefit – think of Paul. When you need a big piece of furniture moved, when you have a mechanical problem with your car, computer, lawnmower or your house is in need of repair and you now need to call a contractor to have it fixed – think of Paul. When you want to find great examples of loyalty to friends, unwavering dedication to public safety, to Marquette University, patriotism to his country, love of life, friends and family – think of Paul. If you wonder what it would be like to have that special friend, that friend who would sit next to you on that lonely, sad day when you need someone to just “listen” to what you were saying, just listen: not talk and just listen – think of Paul. And, when you see Public Safety officers out on the street in your travels – I hope you will find it in your hearts to take a moment now and then to think of Paul. I’ve always believed that one of the most important principals of leadership is that “you must love the ones you lead”. Paul made that real easy for me because, I loved him very much. Until we meet again Paul, rest in peace. 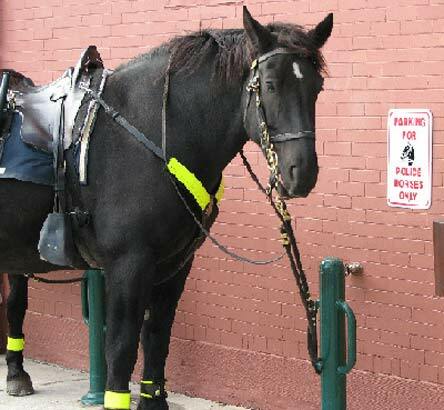 Paul cracked up his boss Larry when he brought in the "Parking for Police Horses Only" signs. 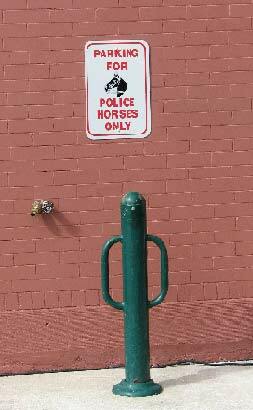 Among the many details that he coordinated during the renovation of the new station, Paul made sure that the hitching posts were complete with a water supply for the horses on hot days. "...if you get a chance to stop by the Public Safety Department in your travels you will see a beautifully framed portrait of Paul (done by [Jan]) in the main lobby area for all to see - “As it should be”. Larry has this photo (above) in his office to remember Paul.